Developed with the goal to save lives and improve recovery time, "Get with the Guidelines-Stroke" has impacted more than three-million patients since 2003. Emory University Hospital and Emory University Hospital Midtown have been recognized for excellence in stroke care by the American Heart Association/American Stroke Association. Emory University Hospital and Emory University Hospital Midtown both received the 2017 "Get with the Guidelines-Stroke" Gold Plus Quality Achievement Award. The awards recognize the hospitals’ commitment and success ensuring that stroke patients receive the most appropriate treatment according to nationally recognized, research-based guidelines based on the latest scientific evidence. 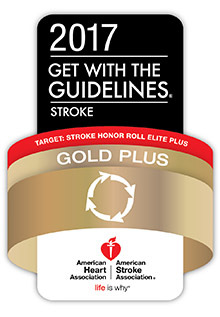 To receive the Gold Plus Quality Achievement Award, the hospitals achieved 85 percent or higher adherence to all "Get with the Guidelines-Stroke" achievement indicators for two or more consecutive 12-month periods, while also achieving 75 percent or higher compliance by reaching at least five out of 10 quality stroke measures. Emory hospitals monitor all 10 stroke metrics carefully to ensure quality care is administered to all stroke patients. Some of these metrics include: stroke education, smoking cessation counseling or treatment, prescription of antithrombotic medication at discharge to prevent blood clots and more. Emory University Hospital was also recognized in the "Target: Stroke Honor Roll-Elite Plus" category for meeting quality measures to reduce the time between the patient’s arrival at the hospital and treatment with the clot-buster drug, tPA. tPA is the only drug approved by the U.S. Food and Drug Administration to treat ischemic stroke. If given intravenously in the first three hours after the start of stroke symptoms, tPA has been shown to significantly reduce the effects of stroke and lessen the chance of permanent disability. "Over a 12-month period, 100 percent of eligible ischemic stroke patients at Emory University Hospital received tPA within 60 minutes of arriving at the hospital, known as door-to-needle time," says Fadi Nahab, MD, medical director of the stroke program at Emory University Hospital and Emory University Hospital Midtown, and associate professor in the departments of neurology and pediatrics. "Sixty-seven percent of eligible patients received tPA within 45 minutes of arrival. Both measures together led the hospital to earn ‘Elite Plus’ status." Emory University Hospital Midtown was recognized on the "Target: Stroke Honor Roll" category, meaning during a 12-month period, at least 50 percent of ischemic stroke patients at the hospital received tPA within 60 minutes of arriving. EUHM treated 57 percent of stroke patients during that 60-minute time period. "A stroke patient loses 1.9 million neurons each minute that stroke treatment is delayed," says Nahab. "These recognitions at both Emory University Hospital and Emory University Hospital Midtown further demonstrate our commitment to delivering advanced stroke treatment to patients quickly and safely." Time lost is brain lost when it comes to stroke. Developed with the goal to save lives and improve recovery time, "Get with the Guidelines-Stroke" has impacted more than three-million patients since 2003.